It may seem a little early to be posting about Valentine's Day, but ladies it's right around the corner! I mean, we're already over half way through January! I will be sharing a few different Valentine's Day outfits over the next couple of weeks, and today is this cute little feminine look! This heart mock neck sweater is so comfortable and is on sale right now for 50% off when you use code WANT! I love it paired with this pink skirt (which is so soft), but it would be equally as cute with a pair of denim! It is never too early to start posting about Valentine’s Day! 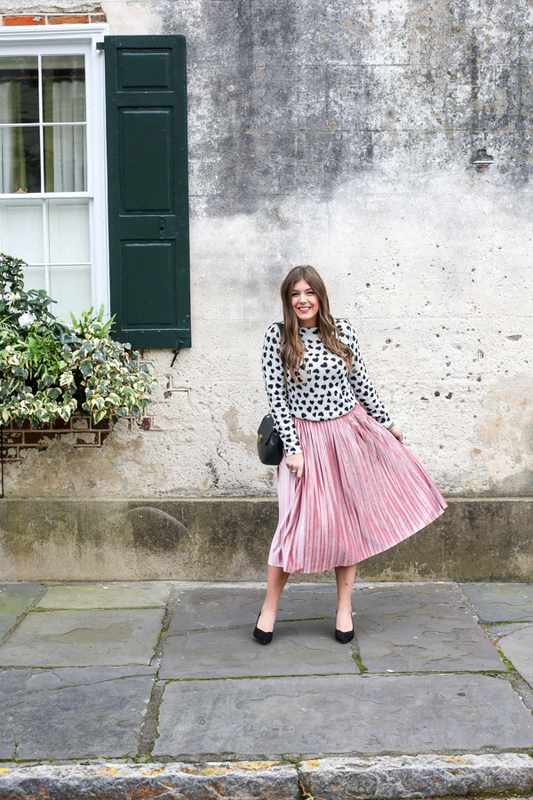 I saw this sweater on Instagram the other day and liked it, but I LOVE it paired with this skirt -darling!! This is so pretty. I love the outfit for any day, not just Valentines. I wish I could carry off pleats as well as you. Not too early at all! I need to figure out what I'm wearing for Valentine's date night! This whole outfit would be perfect! I am so in love with this skirt and sweater combo. I think I'm going to order both! I am in LOVE with that sweater. I just looked on the site and I see that you can wear it out as well! Love a versatile piece! Super cute! 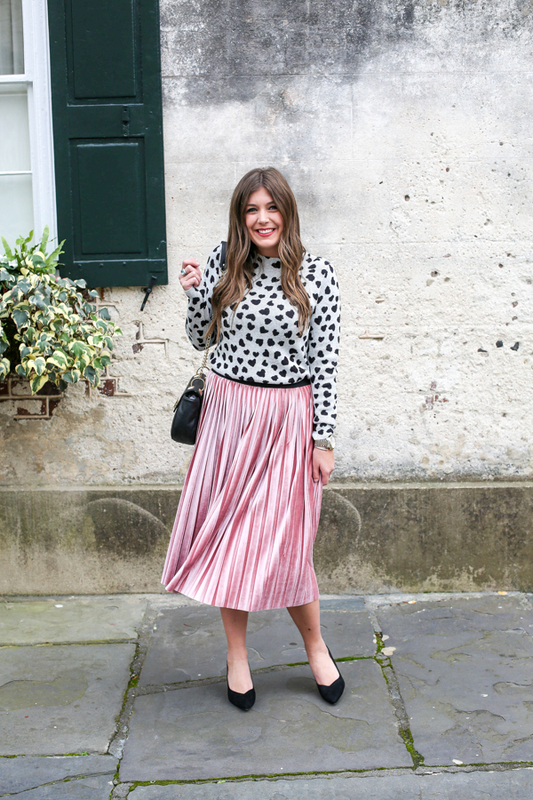 This is the cutest Valentine's Day look! I'd wear this in a heartbeat! What a perfect valentines look! 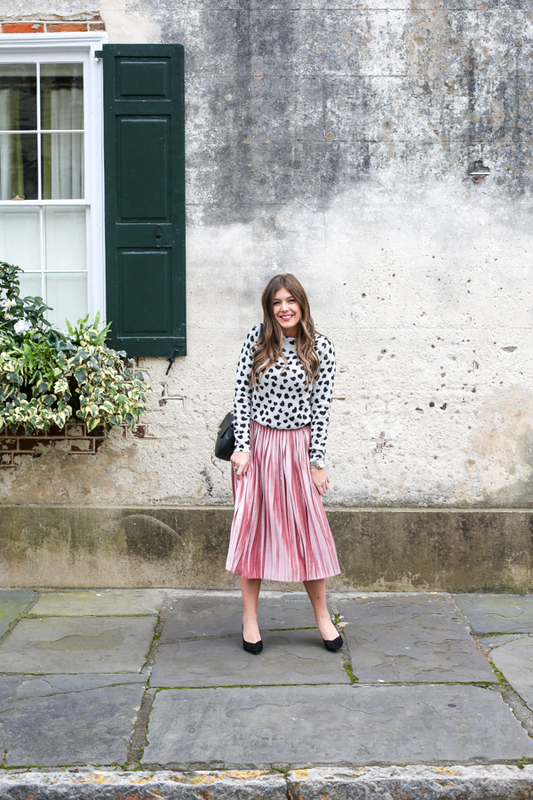 I really love the soft pink pleats and the subtleness of the black and white print. Such a sweet look! Adore that skirt on you! I have the dress in this print and now I totally want this sweater! 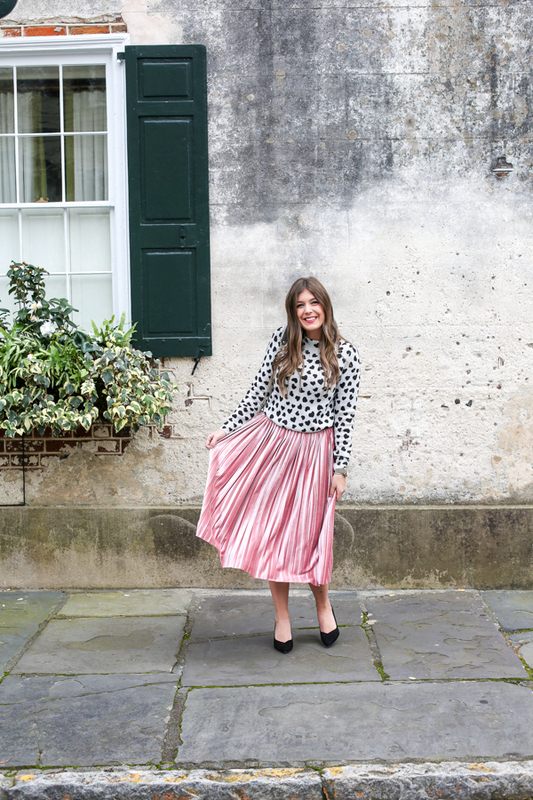 I love how you styled it with this pink midi skirt! Oooh I love the idea of a cozy sweater with a midi skirt. That's so cute and so festive! 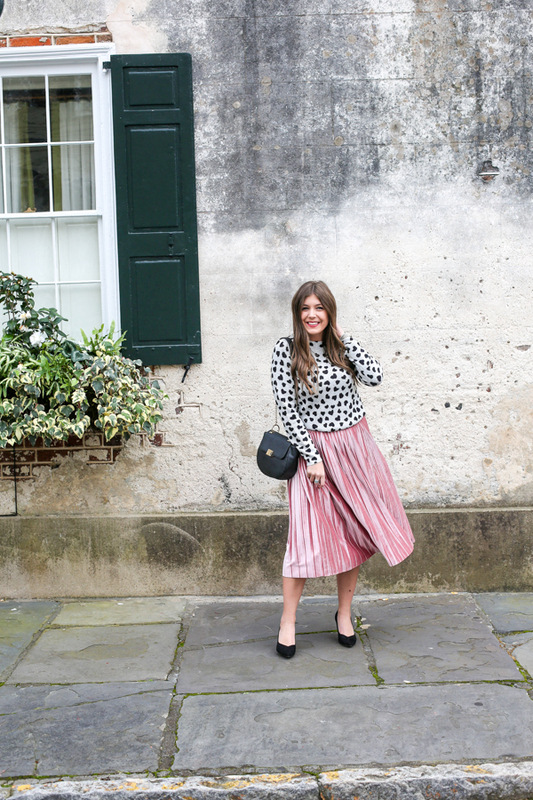 I love the midi pink skirt! The print on the top is so cute! 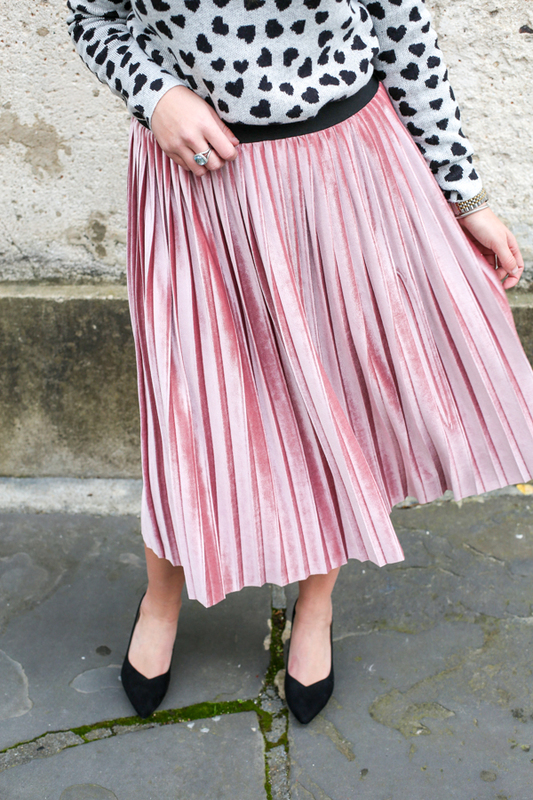 This skirt is so so chic! love how you styled it! That sweater is so cute! And I love how you paired it with a pink skirt. So perfect for Valentine's Day!